Ride level is rated easy to moderate. Road bike or hybrid or e-bike will work best on paved and light gravel routes including Galloping Goose and Lockside trails, Dallas road, east Sooke Park trail to Sooke potholes, N. Saanich Flavourful Trail, and E&N rail trail plus 1 Gulf island / San Juan island trip. You need some gears, not a townie bike as Victoria has hills! Plan on a full day because we will ride relatively slowly and make several stops. This group is for leisurely walkers, or someone who hasn't been walking for a while & would like a slower pace, or someone who has an injury that is keeping them from walking with the other much more active Saturday Morning Walking Group. 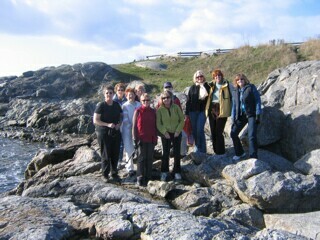 We meet every Saturday for a 1 hour leisurely walk followed by coffee. This is a wonderful way to meet new & "old" friends as you walk in and around different Victoria neighbourhoods. Meets: Every Saturday 9:30am – rain or shine! We meet every Saturday morning for a 1 ½ hour walk followed by coffee. This is a wonderful way to get to know people, get some exercise, and learn about our different Victoria neighbourhoods. Welcome to beautiful Vancouver Island - a paradise for hikers. 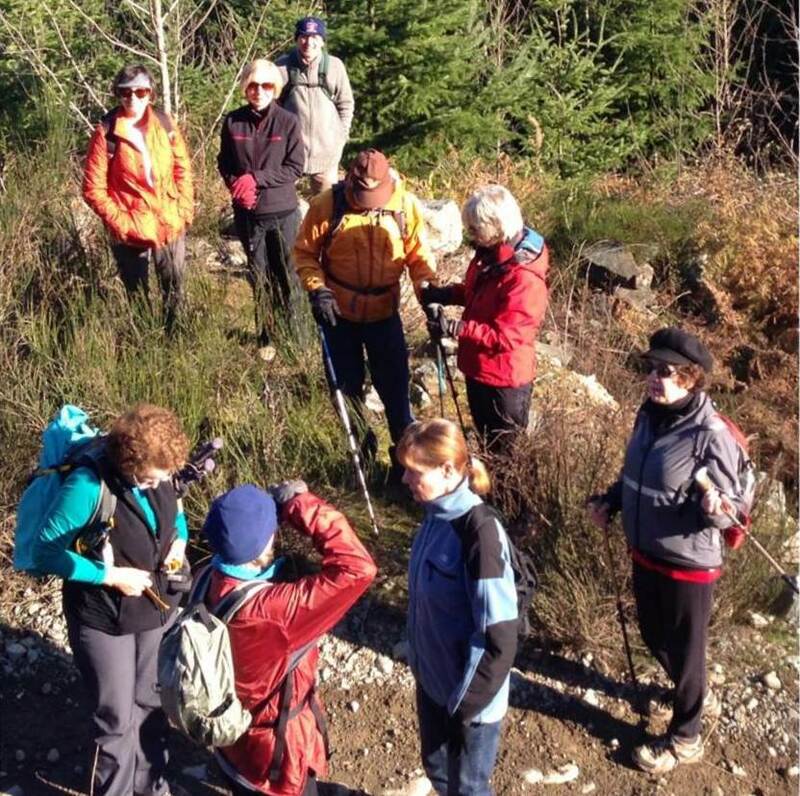 Join us in exploring local hiking trails at a reasonable pace, enjoying the sights along the way. We meet monthly for a moderately paced hike. Hikes are generally 5 to 8 kms. Partners, friends and well behaved dogs are welcome. An informal group open to anyone interested in poetry or curious to know more about it. Each month we will look closely at a poem written by a major (or minor) poet, exploring what is going on in the poem and what it might have to say about our lives. Monthly visits to local art galleries and art exhibitions will be organized to help you learn about and appreciate the talented artists in this area. We look forward to meeting those of you who are interested in a variety of live events. Victoria offers some great performances in music, dance and theatre, as well as tours and festivals - which could entail traveling a little further afield! Share the experience of seeing a film each month. Movies are selected based on what’s getting the best reviews and most likely to appeal to our members. Each year we see some amazing films, usually at a downtown theatre. In the months leading up to the Golden Globes and Academy Awards, extra movie nights are added so that we can see many of the nominated films. Meets: Usually the 2nd Monday or Tuesday evening of the month, with extra Mondays or Tuesdays during awards season. The Happy Appy Group will meet in various venues around Victoria that offer “Happy Hour” to enjoy great drinks and appetizers with new friends. Group members will take turns each month to identify the next great appy place. The time will be between 4 and 6 PM. This is a social group primarily aimed at encouraging VENC’s long term members (5+ years) to maintain connections with old friends. Activities will vary depending on the host and spouses may be included in a few activities. Join us to explore the bounty of our province and our Island. Activities include visits to farmers markets, farms, and wineries, local producers, collaboratively prepared gourmet/theme meals, restaurant visits, or just swapping recipes and talking food. Come meet some new and old friends at one of the Pubs around town, once a month. Have some food and drinks to wrap up the week. Spouses and partners are welcome. Each member will have a turn hosting at her home this monthly event. Ladies potluck does not include partners. The hostess contacts members by Evite and coordinates what type of dish each member will bring. It’s a great way to get to know other members and some local restaurants. Members meet monthly at various restaurants to relax and enjoy brunch and great conversion. Come meet other newcomers once a month for tapas and fun. Individual members take turns to host at their homes and guests bring an appetizer to share and their own beverages. Spouses and partners are welcome. Have fun discovering and exploring some of Victoria’s best kept culinary secrets. From hole in the wall to trendy eatery we want to try the mainstream and the not-so-mainstream over the coming months. Bring your own knitting or crocheting project. Share knit or crochet tips, techniques, etc. while working on your project and chatting with others. New and experienced knitters and crocheters welcome. Meets: Fourth Wednesday of the month. It's not just Monopoly and Scrabble! Come out and try your hand at something new! Have fun getting together with your fellow club members and learning new games. We will be alternating between learning new games and repeating favourites. Sometimes we will meet in members homes, other months going to the Interactivity Board Game Café on Yates Street, where they have a good selection of board games to play, and they are helpful in teaching you new games. Spouses and partners welcome, but not required. Meets: First Thursday of the month. This group is for players of all skill level...including beginners. Let the convenor know if you are new to the game and she will be sure to get you off on the right foot with instruction and practise games. Seasoned players can play with others who know the game...or help teach by partnering with a new player. Instruction will be based on the North American version of the game, using cards for 2017 from the National Mah Jongg league. Don't worry if you don't know what that is...it will all be explained. A friendly, competitive atmosphere is desired at the tables. Meets: Weekly in different member homes, Thursday evenings at 6:00. Getting together with fellow wine lovers to make a variety of wine at local u-brew vendor; and being able to share the standard 30 bottles per kit with members of the group allows you to try different wines without having to commit to all 30. Get together monthly with fellow poker players in members’ homes for a fun evening of cards. Both ‘newbies’ and seasoned players’ are welcome, but no serious betting. Did you know Victoria has a one in three probability of a damaging earthquake in the next 50 years? It’s not a matter of if an earthquake will happen, but when. But it’s not all doom and gloom - preparing for an emergency can be fun and interesting, and you don’t have to do it on your own. The club’s Emergency Readiness Activity Group – relevant for all sorts of emergencies, not just earthquakes. Check out also the Emergency Readiness Forum on the website - your go-to place for useful information and website links for members' reference. Meets: several events are organized through the year for new club members (First Years), members of the activity group and subscribers to the Emergency Readiness Forum.